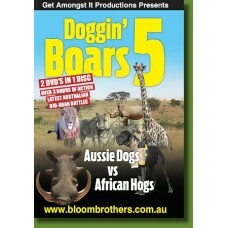 "Aussie Dogs vs African Hogs"
Travel with the Bloom Brothers and their Aussie pig dogs for the biggest test yet. Share the highs and lows, victories and defeats as the Aussie hunting team try to adapt to Africa's harsh conditions, dodging Rhino, Buffalo and many other dangerous game to mix it up with the super fast, tough and crafty Warthogs of Africa. With the warnings fresh in their minds from the African hunters of the Warthogs' killer reputation, "Warthog are known to kill lions", Rip and Black are in Africa mixing it with the dangerous hogs of the wildest continent on earth. See up close and in detail the differences of the African bush pig and warthog. Also watch as they update you with their up and coming young dogs back home as they battle lone boars one-out to make it in the team. See them collide on their first one out catches with the fiery Gulf boars and the famed channel country boars. They also hit the reputed Cape York's dog-killing, big-boar hotspot. Tony Pizzata from Sporting Shooters says "These guys take their dogging to the max and in their latest release Doggin' Boars 5, Greg and brother Craig go the full hog, pardon the pun, and ship themselves and their dogs to Africa for the ultimate hunt after wart hog!. Aussie dogs verse African hogs as the boys put it, is an adventure that spans 3 hours of video viewing. You'll witness the full journey, its people and the ultimate catch, wart hogs with dogs. In this DVD you'll see Africa's harsh conditions and many of it's dangerous game as well as the ultimate catch for warthog and the African bush pig. More than just a hunting video, I enjoyed the diversity this film had to offer." 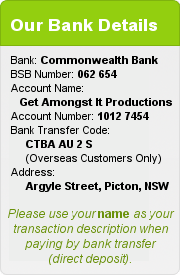 PLEASE NOTE: Due to DVD format incompatibility, we do not supply DVDs to the UK.